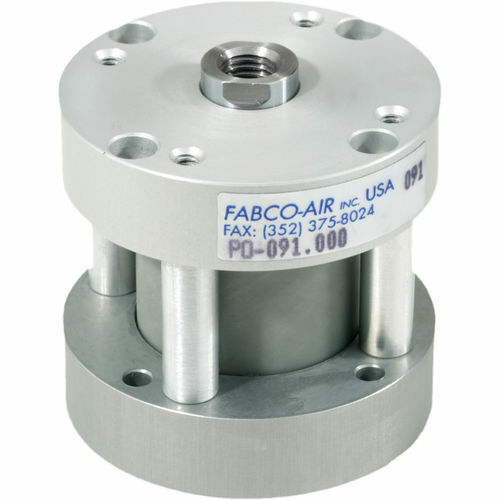 FABCO-AIR's Original Pancake® Cylinder was mainly designed to aid the need for short stroke cylinders to fit in very tight spaces since 1958. The Pancake® Line provides an extreme difference against its imitators because it has high quality materials coupled with strength and appearance which also can be considered to last longer. Its features include 8 Bore Sizes (1/2" to 4"), Strokes to 4", Machined from Aluminum Bar Stock, Duralon® Rod Bearing for Reduced Wear, Prelubed with Magnalube-G® Grease. It also has a Chrome Plated Stainless, Steel Piston Rods, Air Service to 250 PSI, Hydraulic Service to 500 PSI, Dozens of Options Av.